(Nanowerk Spotlight) Chiral metamaterials with strong chiroptical properties are an interesting new platform for optical signal modulation. Although plasmonic super chiral fields have been successfully applied to detect the chiral structures of proteins, it has remained challenging to detect the structural handedness of drug molecules due to their small size and thinner film adsorbed on the surface of metamaterials. Researchers have achieved these materials by stacking arrays of crosses, split-rings, and rods with interlayer twist. "These previously developed chiral metamaterials rely on site-specific symmetry breaking, where the nanostructures in the top layer have a site-specific twist with respect to the nanostructures in the bottom layer," Yuebing Zheng, an Assistant Professor in the Department of Mechanical Engineering at The University of Texas at Austin, tells Nanowerk. "It has remained unknown whether the twist between lattice directions of two periodic arrays can introduce strong optical chirality without the need to control the rotation of each unit." His group's findings have shown that lattice-dependent twist can also induce strong chiroptical properties, which show higher potential for practical applications due to the cost-effective and high-throughput fabrication, and high tunability. 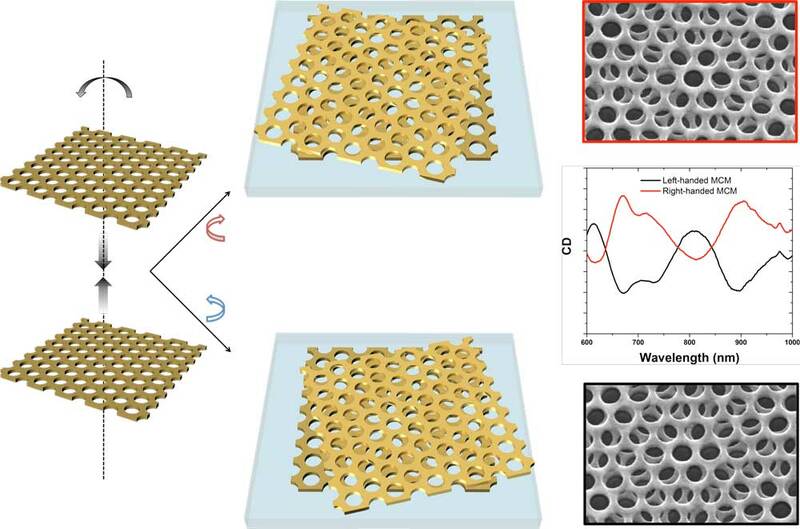 We have reported on the Zheng Group's development of a new type of plasmonic metamaterials in a previous Nanowerk Spotlight ("Moiré Nanosphere Lithography allows fabrication of large-area tunable graphene metasurfaces"). Now, in new work published in Advanced Optical Materials("Moiré Chiral Metamaterials"), the team reports a new type of plasmonic chiral metamaterial – called moiré chiral metamaterial (MCM) – by stacking two layers of identical achiral gold nanohole arrays into moiré patterns. "The chiroptical responses of the moiré chiral metamaterials can be precisely tuned by the in-plane rotation between the two layers of nanohole arrays," says Zilong Wu, a PhD Candidate & Graduate Research Assistant in Zheng's group, and first author of the paper. "We also demonstrated the label-free enantiodiscrimination of chiral proteins and chiral drug molecules at the picogram level. With their ultrathin thickness (∼70 nm, which is only ∼1/10 of the operation wavelength), strong chirality, and high tunability, moiré chiral metamaterials will advance a variety of photonic and optoelectronic applications." He points out that the existing chiral metamaterials on substrates are either inherently chiral plasmonic nanostructures or anisotropic achiral plasmonic nanostructures stacked into chiral structures with site-specific twists. These prerequisites often lead to the use of sophisticated lithographic techniques such as e-beam lithography and focused ion-beam lithography that limit the practical applications. In addition, there are still problems in current techniques to achieve high tunability during the fabrication of chiral metamaterials. The researchers' new MCMs significantly lower the fabrication cost and complexity by combining conventional nanosphere lithography and a common wet-transfer process. "The chiroptical responses of the moiré chiral metamaterials can be precisely tuned by the in-plane rotation between the two layers of nanohole arrays," notes Wu. "Furthermore, we have demonstrated the label-free enantiodiscrimination of chiral proteins using MCMs. The MCMs are also applied to distinguish R-thalidomide (a drug molecule for pain killing) from its 'evil enantiomer' (S-thalidomide, which causes deformity of newly born babies) in picogram level." "Moiré chiral metamaterials can pave the way for commercially applicable chiral metamaterials due to the potential for high-throughput fabrication," says Zheng. "In addition, our enantiodiscriminative sensing results have shown the high sensitivity in detection of structural chirality of small chiral drug molecules, which is of crucial importance to medical industry because the enantiomers of many chiral drugs have harmful effects on human body." In addition to enantiodiscriminative sensors that are significant to medical, food, healthcare, and environmental industry, the strong optical chirality in MCMs can also be applied for broadband polarizers and polarization-dependent photodetectors. Going forward, the scientists aim to improve the large-scale uniformity of MCMs and the precision in controlling the relative in-plane rotation angle between the two gold nanohole layers. Such improvement will pave the way for chiroptical devices including broadband polarizers and polarization-sensitive photodetectors.